Every pool needs a fence. Current pool owners looking at replacing the pool fence know why it is a huge part of your pool area. For new pool owners, there are several reasons planning fence installation should be done at the same time you plan your pool. A fence should be installed and operable well before your pool is finished. Most local municipalities and homeowner’s associations have laws requiring fencing around all pools. Some have specific requirements on height, colors, types and how it is to be secured from the outside world. You need to understand all that is required of you before you select fencing for your pool because failing to install adequate fencing could result in a citation with a fine. Plus, you will be required to replace your fence or add fencing. It’s no secret that many children and pets die from drowning in their own or a neighbor’s pool. Statistics show an average of 392 people died every year from 2005 through 2014 across the United States fro non-boat related drownings. Proper fencing and security will prevent these unfortunate tragedies. Quality fencing adds to both your property’s marketability and value. Real estate professionals state that a fence will increase the curb appeal of your home and that has improved value, but none can define exactly how much in dollars adding a fence will do. Most say homes with fences do sell much faster than those without and most looking at homes ask about fencing. A pool isn’t just for swimming. A pool is a centerpiece to landscape design. It is part of a whole picture that includes walkways, outdoor seating, flowers, bushes, and fencing. The fence is the backdrop to the design and zones off the space to make the landscaping work as a private oasis for you and your family. Fences do make for good neighbors. A quality fence will keep others, whether it’s a neighbor’s child or a criminal looking for a way to burglarize your home, from entering your property. It is simply another way to limit access and that means a more secure home. It can also prevent your children or pets from leaving your property. There are a number of quality fences to surround your pool. Wood or vinyl paneled, cast iron and chain link are three of the most recognizable types of fencing. However, there are a plethora of options within those categories and even more beyond those choices. 1. A mesh interior pool fence is one of the top choices for pool fencing because it surrounds the pool itself, but leaves the rest of the landscaping area open for everyone to enjoy. This typically is four feet high and most have a climb resistant surface that is see-through, so you can still enjoy the beauty of the pool. It can come either permanently installed or removable, so you can take it down for parties or when the pool is in constant use. 2. 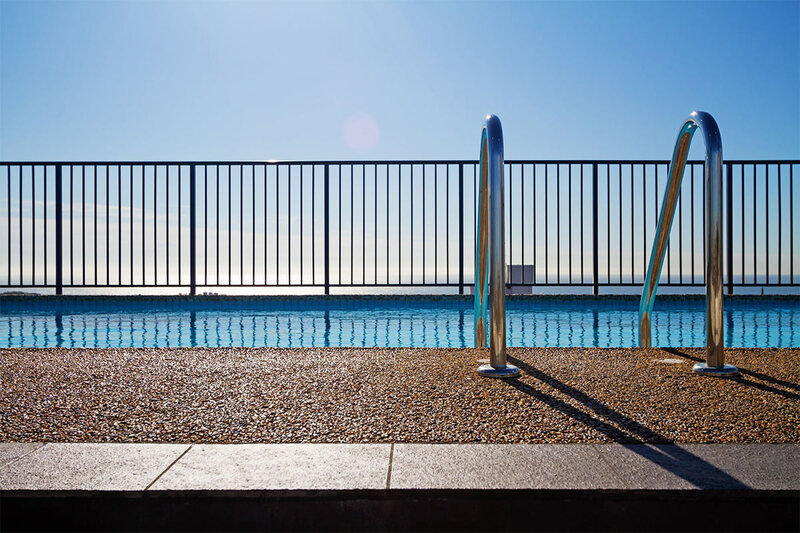 An iron perimeter safety fence is popular because it provides a great barrier to your yard as well as preventing people from entering the pool area. It is highly decorative as well and can add a lot to landscaping. 3. Aluminum pool fencing is an affordable option to the iron. They look similar to iron with thin slats with a few inches of space in between each. They do not rust, are easy to clean and last a long time. They also come in a variety of colors including black, gray, white, taupe and other warm colors. 4. Glass panels are hot on the market today. One of the more expensive options, they look rich and add chic to your pool area. They either are frameless or come with metal frames. They last well and come resistant to things like pool chemicals. They are also easy to remove and store. 5. Wooden fences are the traditional go-to fence for many homes because of their classic look. However, you don’t have just the flat panel style to choose from anymore. They come with wider or thinner slates, open slates, lattice, and designed toppers that turn your fencing into something special. They also come in a variety of woods and color stains. Wood fences are also affordable. Your choices for pool fencing primarily depend on three things beyond cost: style, privacy, and security. You will want a style that goes with the home because an “off” style will do nothing to help marketability and resale value. The degree of fence privacy you need depends on your and your family’s personalities. Some want to see the world outside the fence and those who are really social want to call out to neighbors as they pass. They should get fencing with open, thin slats. Others required complete privacy. These type of homeowners do well with six foot or higher wood or vinyl privacy fencing with no open slats. Security is a misunderstood term becaues most people see it as a way to keep others out. However, security also means keeping those on your property safe. This is especially true for small children with access to the backyard where there is a pool. A pool fence with a secured entry, even for those coming from the back door of the house, would go a long way to protecting those you love. You will be happy with the beauty of a really good fence. Surrounding your pool space with a fence that looks good will make you proud whenever your family uses the space or when you entertain. It will last far longer than cheaper fences too. Paying a little more for a high-quality fence will give you peace of mind knowing it will do its job of keeping everyone, from your family to others in the neighborhood, safe.